Twin Speak:DressCode: Roll Out the Barrel. Oil, Whiskey, Pickle or Cracker? Roll Out the Barrel. Oil, Whiskey, Pickle or Cracker? Twin Speak: Seriously...this is the real cover from the New York Magazine (except we're not on it). 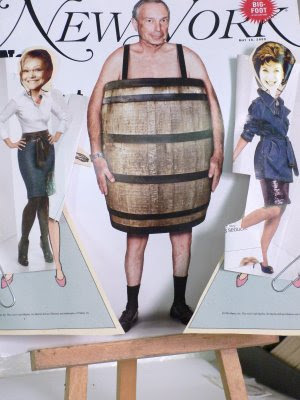 NYC Mayor Mike Bloomberg, what kind of barrel is this? Oil, Whiskey, Beer, Pickle or Cracker? "Roll Out the Barrel" (Click on the Blog title above to hear it) is a catchy party tune, and maybe we'll see people rolling down the street in barrels instead of taxis if Bloomberg doesn't address NYC's budget woes. But, Mayor B., it's not a good look for you. Stick to pants, not slats!